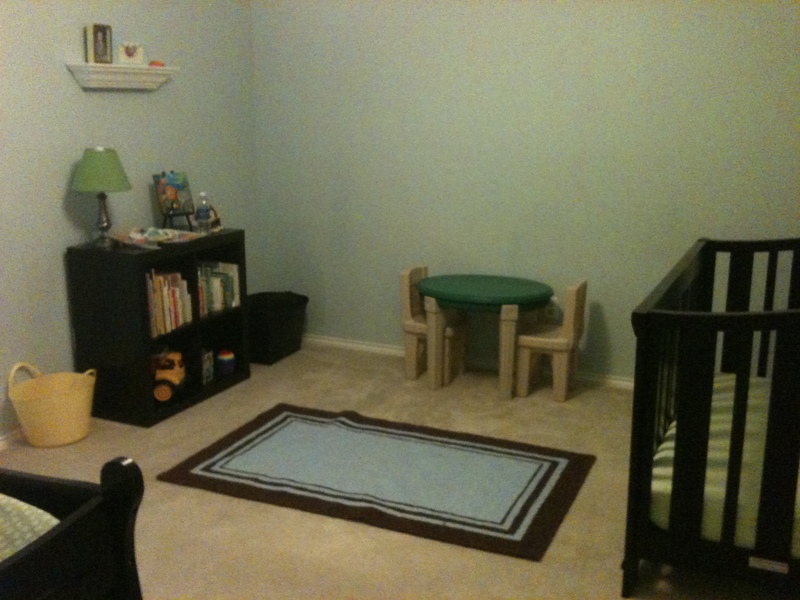 I really wanted Dominic to have a big boy room before his sister came. Charlotte Leigh is nearly 20 months old and we are getting really close to getting his room to that place. Ah… good intentions. 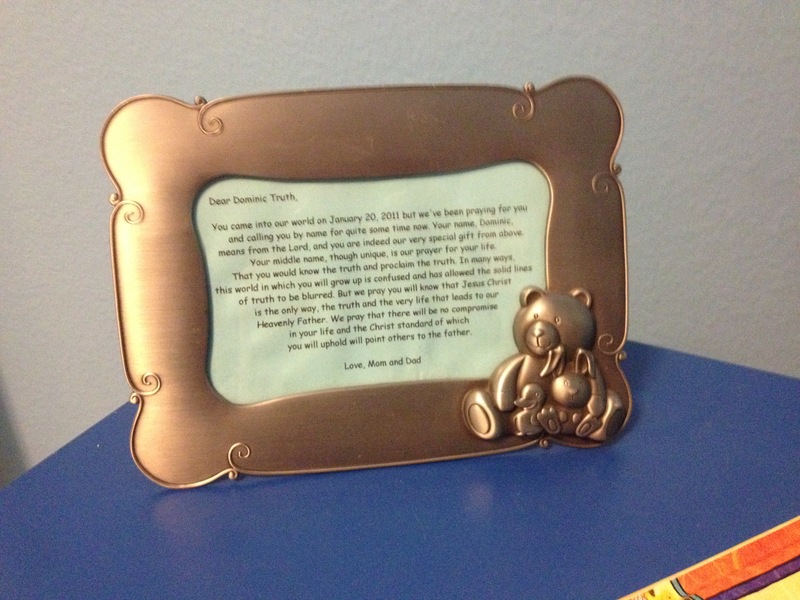 When we moved in, we tried to set his room up as close to what his room was in the old house to make him feel good about being in a new home. Dom’s room when we moved into our home. 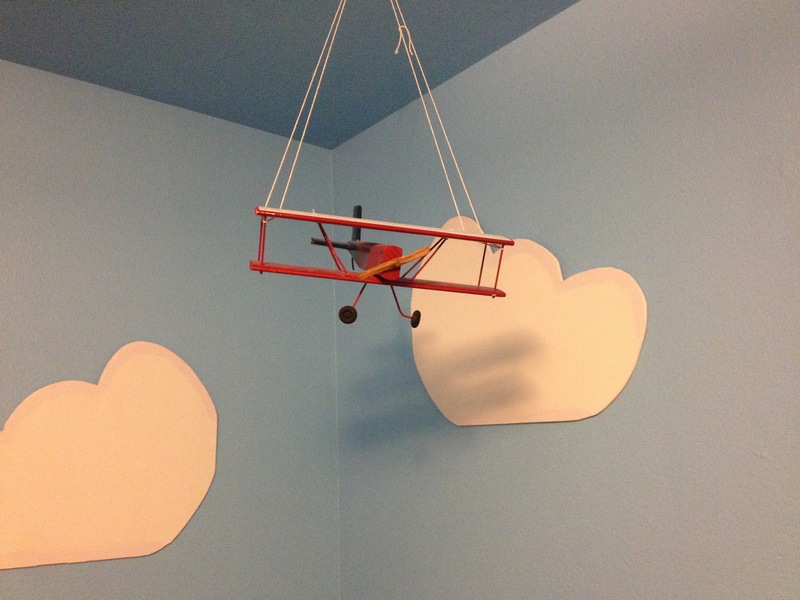 About a month before our daughter was born we were able to paint the room a beautiful blue but that is really all that happened for a few months. The pictures below show the room as it looks today. From about February 2013 till now has been a slow and long process but so worth all the additions, changes and hodge podge attempts to make what I saw in my head match what I could see with my eyes. The picture below was taken from the entrance of his room. So much to talk about. But let’s focus on the big boy trundle bed. We purchased this from a friend for a great price! As I said, it’s a trundle but also has another bed that makes it a bunk bed! 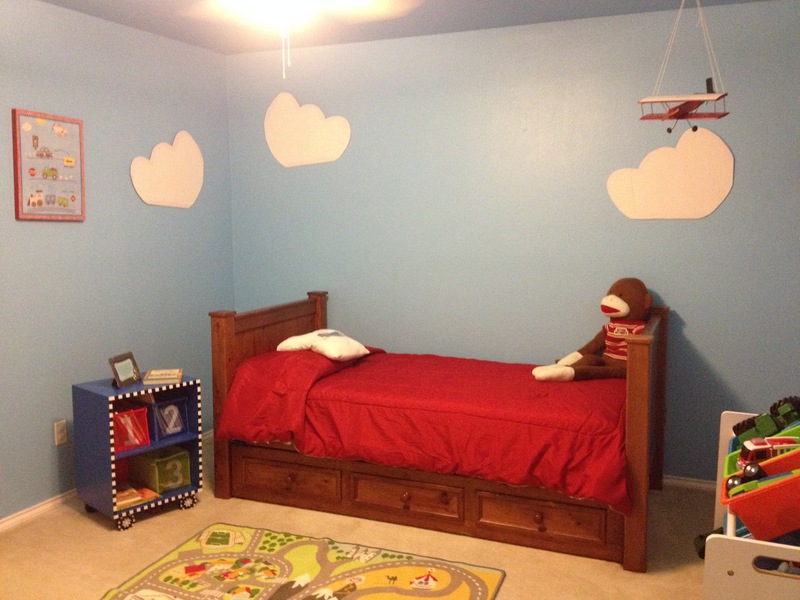 This bed will make raising two boys through different ages and stages a blast! Here’s another view of the room. 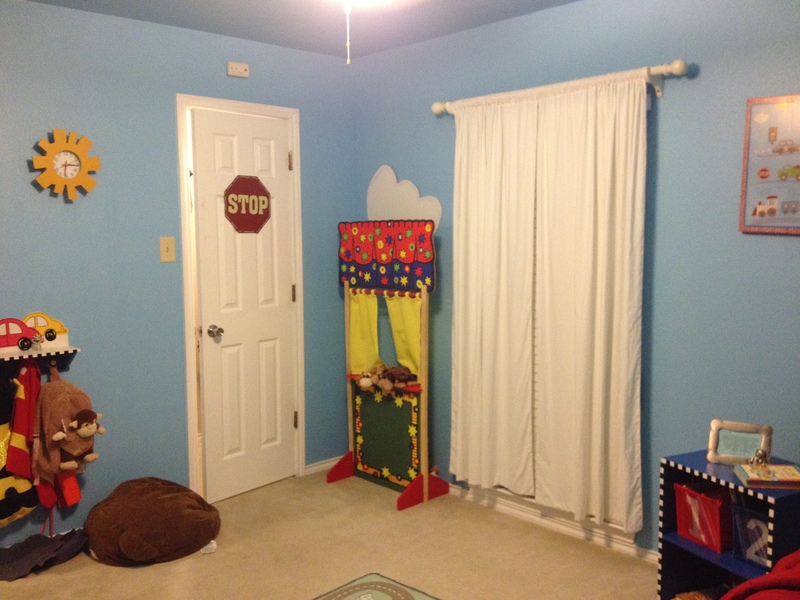 The door with the stop sign is his closet which is really big and again will make raising two boys more convenient. Dom has had several different toy holding contraptions. This one is amazing. I love how there are so many different buckets. Being the weirdo I am. Each bucket serves a certain purpose. There’s a bucket for his cars. There’s a bucket for his puppets. There’s even a bucket for random toys like his lone army man and bouncy ball. And he does a pretty darn good job at putting things where they belong. 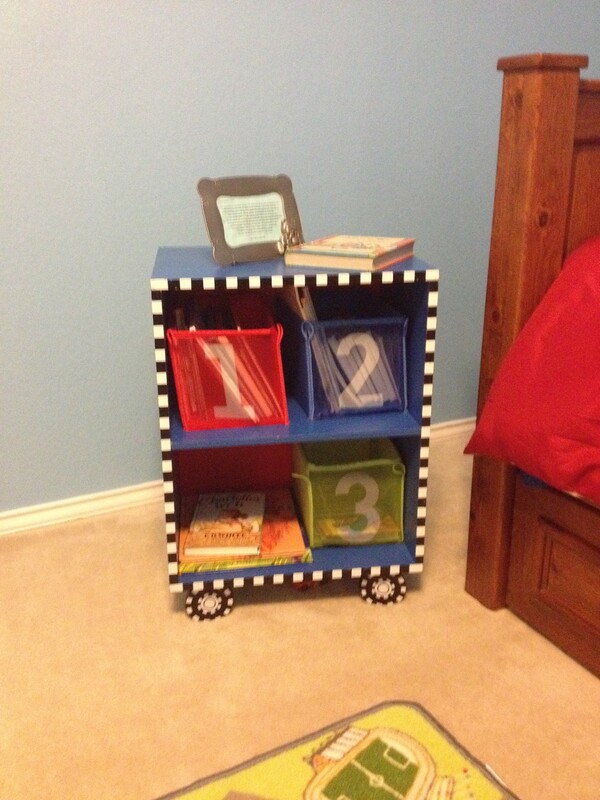 Love these toy storage units. Here’s an area I’m working on. A dress up area.Yes that’s a Bumble Bee costume hanging there. I’d love to get a fun mirror (maybe this one from IKEA ) mounted to the right of the costumes. 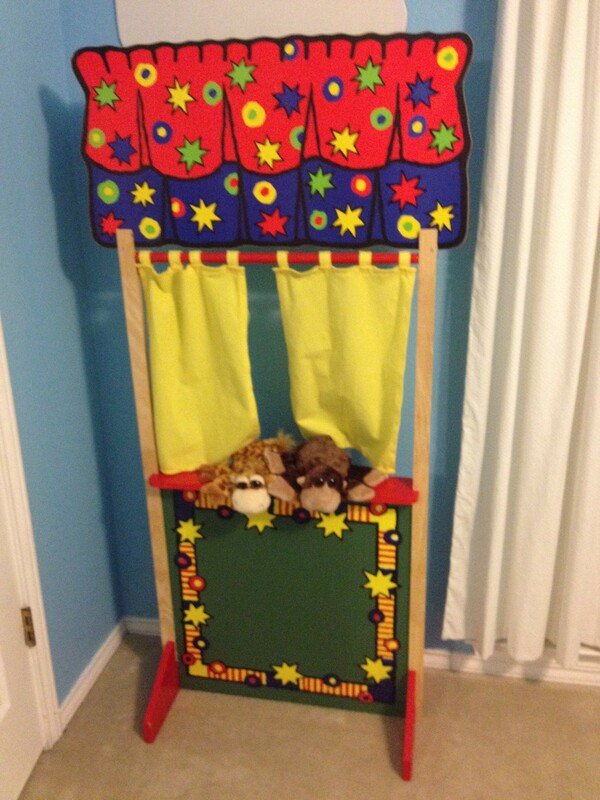 I’d also like to purchase a soft cloth toy storage chest I’ve had my eyes on at IKEA to store extra costumes. Below are just some really fun close ups. And just as if you were in the room with me, I’d love to tell you the story behind some of these awesome items. 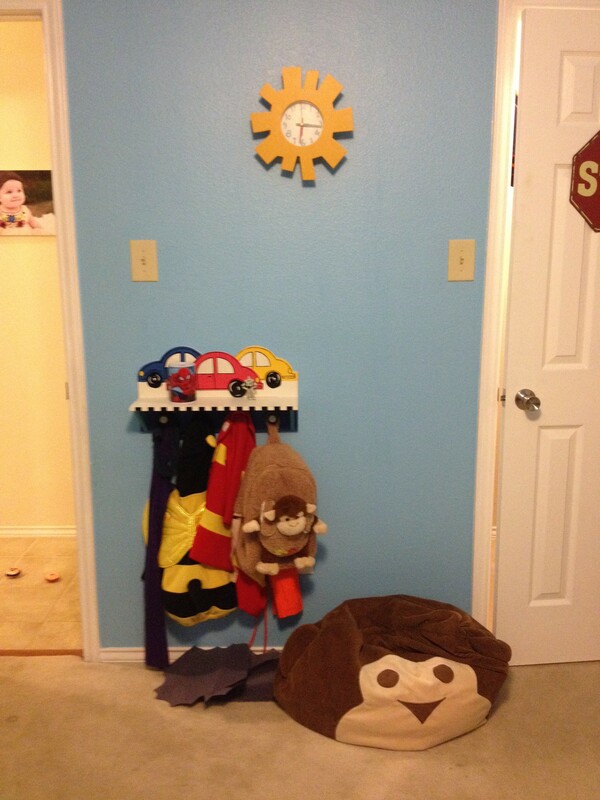 Dom’s nursery was decorated with jungle animals and very heavy on the monkey theme. 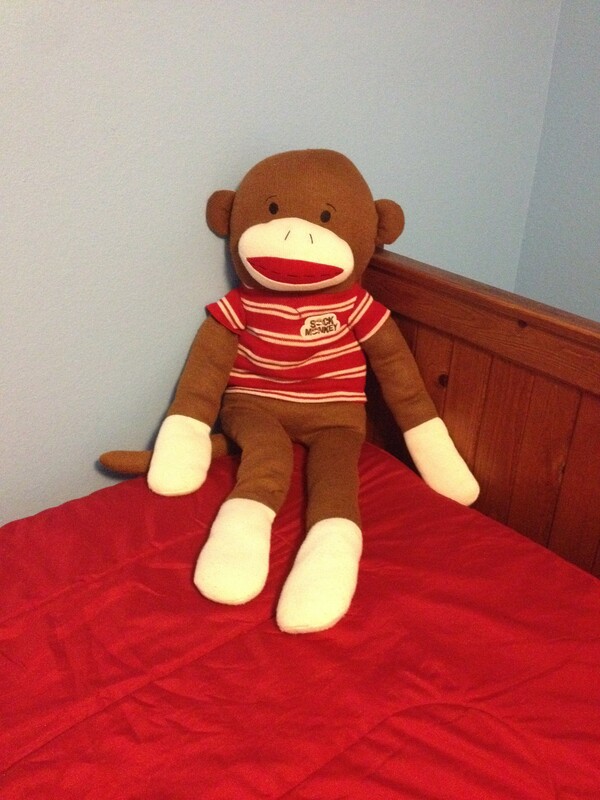 Marshall’s mom sent us this amazing sock monkey for Dom’s first birthday or maybe first Christmas? 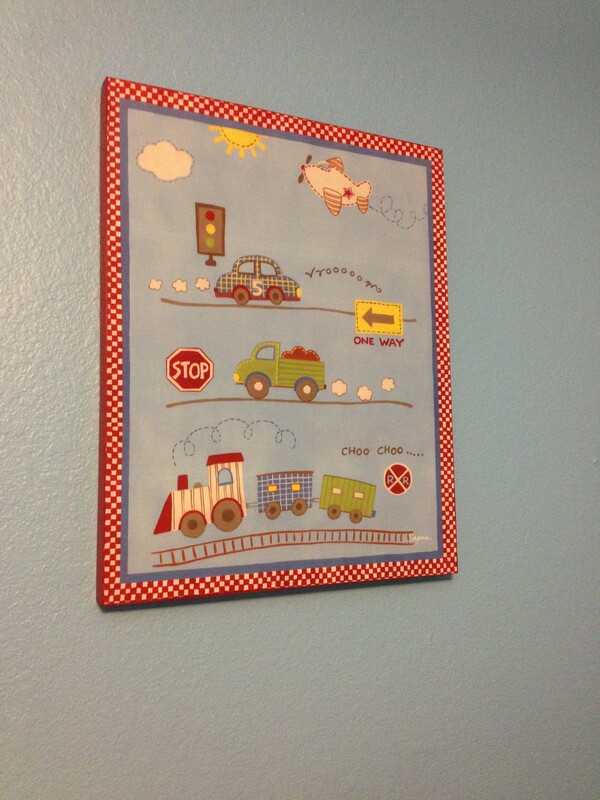 Even with the change to a big boy room with a transportation theme I could not….can not bring myself to part with this adorable fella. Dom loves him! This pillow. THIS. PILLOW. Marshall’s uncle Gordon made this shirt for him when he was Dom’s age. Once he outgrew it, Mar’s mom turned it into a pillow. I think it goes perfectly with his room and I love the history it has! 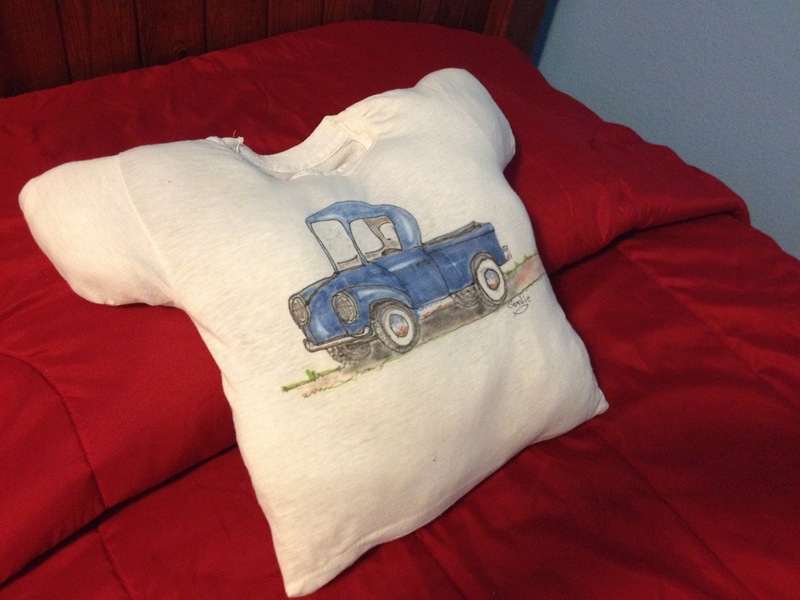 Pillow made out of a t-shirt Marshall’s uncle made! I love thrift finds. In this era of the internet, I have gotten hooked on garage/yard sale sites on Facebook. I found this cute little sun clock on one of those sites. Clock I bought on the cheap from a Facebook yard sale site. This puppet stage has been here and there and every where. It is now housed in Dom’s room. It’s not getting a lot of use these days, but I am hopeful in the coming years as all three kiddos age and their imaginations bloom that our entire family will get a lot of entertainment out of it. The fact that it retails over $100 and I got it at a yard sale in perfect condition for $15 is pretty sweet too! Love the IKEA storage baskets that hold all of Dom’s books these days. Bookshelf I found at a children’s consignment sale. On top of Dom’s bookshelf are two of my favorite things in Dom’s room. 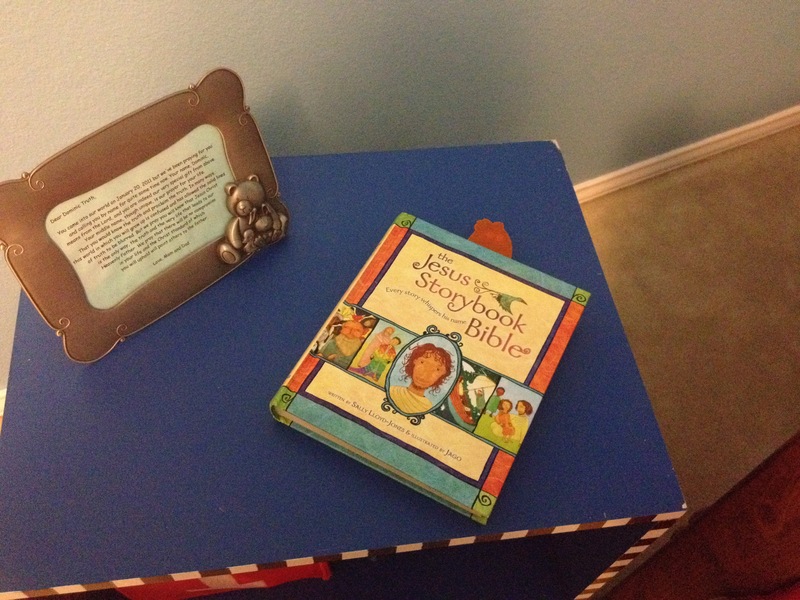 The Jesus Storybook Bible which is so awesome! I highly recommend for children nearing 4 years old and older. It points every story back to Jesus. So you’re reading about David defeating a giant and saving God’s people and it wraps up by talking about how there would come a hero who would defeat an even bigger giant and save God’s people for always. Dom. Loves. It. The second thing that means the world to me is this framed piece of blue copier paper that holds Dom’s LifeVerse. We gave our son the name Dominic Truth because we pray that he would always know where he came from…Dominic means from the Lord. And that as he grows to understand faith that he would place it in Jesus and NEVER EVER waiver from it regardless of what the rest of society deems as truth. 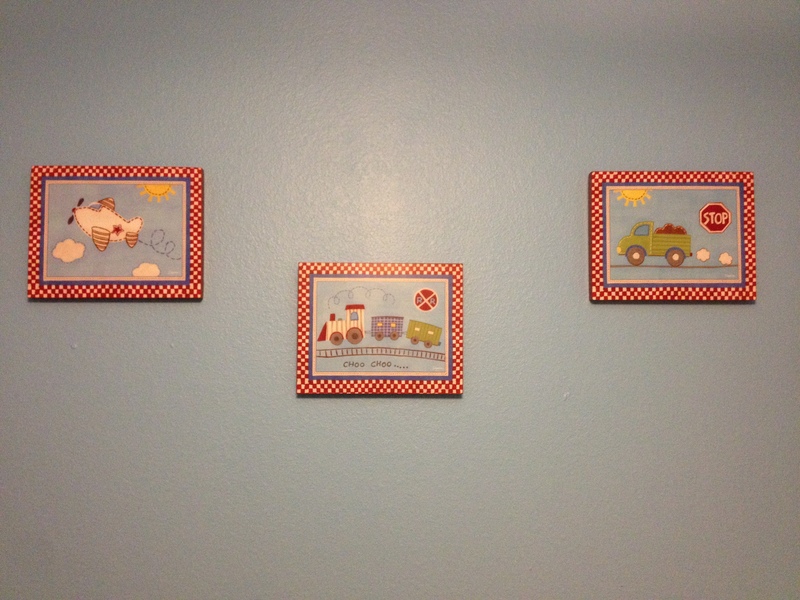 Got all four of these cute pictures from Hobby Lobby. 50% off of course. I love these clouds. My husband made them starting from free handing the design on plywood, cutting them out and then painting them. 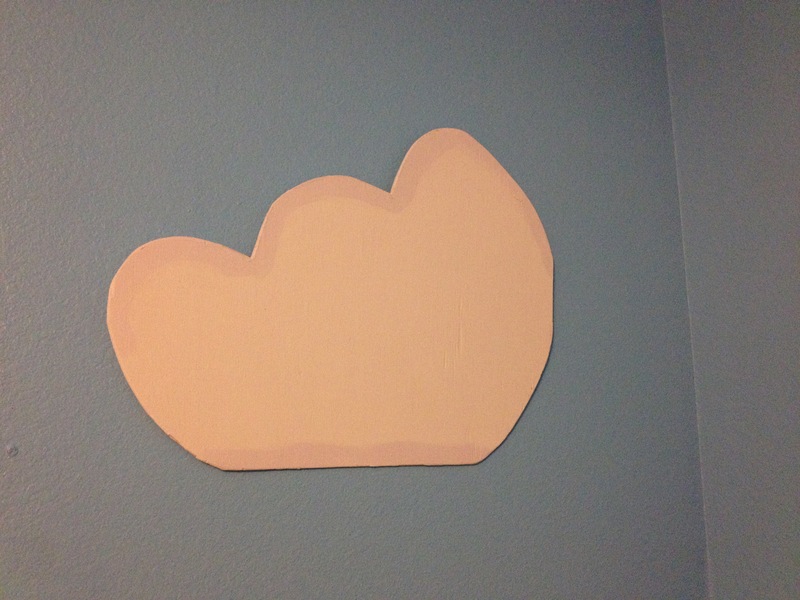 My very talented husband made these clouds! 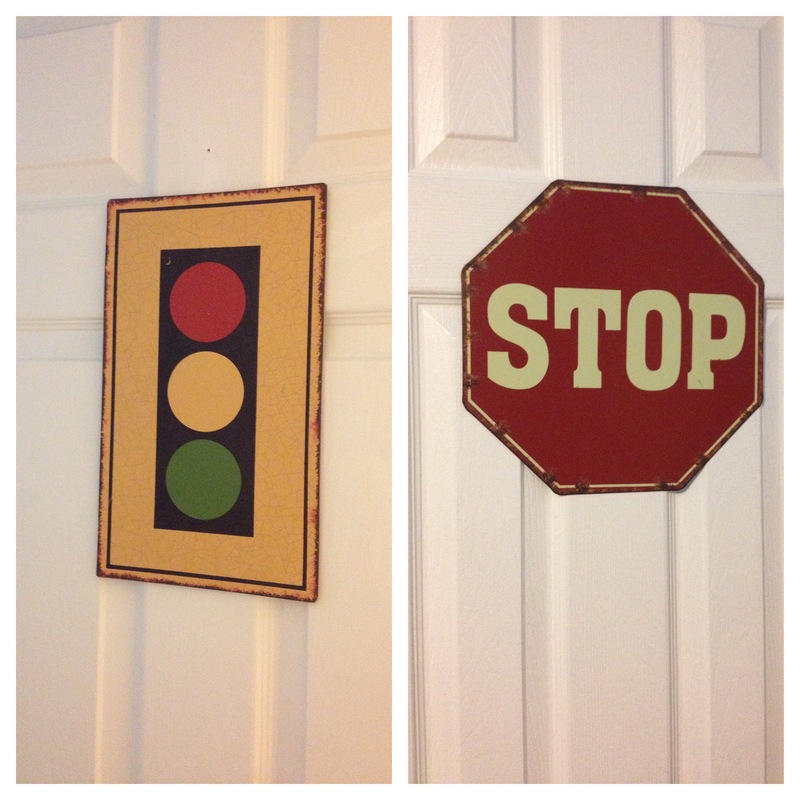 The Stoplight is on the bedroom door and the Stop Sign is on his closet door. Found these in, you guessed it, Downtown McKinney! 1. 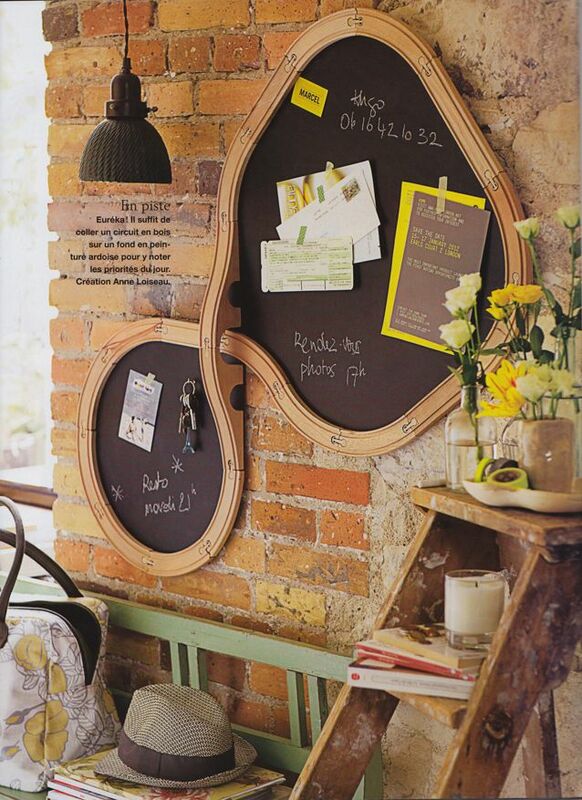 Buy pieces that will outlast your theme. Dom’s big boy bunk/trundle bed will serve so many purposes beyond the here and now. Try to stick with me. It’s my hope that by the time we are ready to move baby boy due in January out of our room (to a yet to be determined location), Charlotte will be ready for a big girl bed and we’ll be able to use the top bed (currently stored in the garage) for her and baby boy can inherit his sister’s crib. One of these days, baby boy will outgrow the crib and we can either use the trundle part of the bed or convert Charlee’s crib to a toddler bed. Then when the boys can actually handle bunk beds we’ll put them together and look into big girl furniture for Charlee’s room. 2. Be patient with your decorating endeavors. 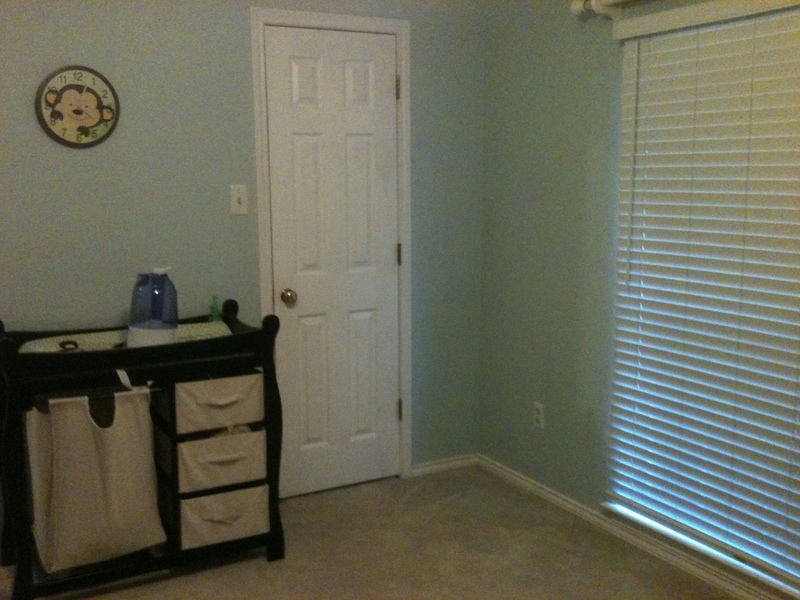 Dom’s room was freshly painted with no other improvements for months. Then we put the clouds up. They stayed like that for another few months. Piece by piece was added like the transportation pictures from Hobby Lobby. 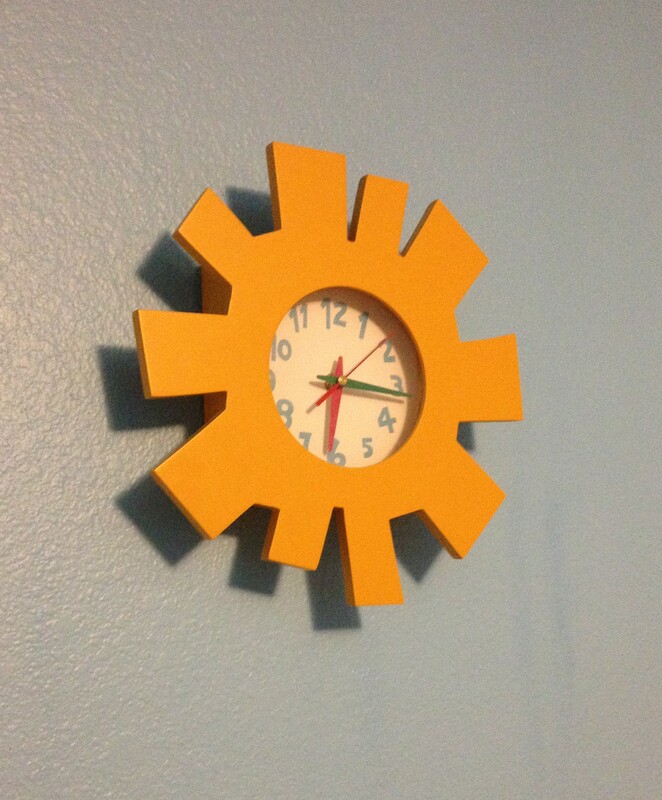 And then I stumble upon the clock that just happens to have the same blocky look as the sun in the hobby lobby pics that also have clouds very similar to the ones my darling husband made! And then the Stop Sign and Stop Light I got from a second hand shop and you’d think they were a part of the same set as the Hobby Lobby pics!!! And yet…it’s been two years in the making and I still have one more idea in my head. It is on my honey do and I really feel that once I get this completed, and placed between those clouds above Dom’s bed, I will be at a place where I will just be adding touches here and there. 3. Be proud of your work. It’s not easy to decorate a space. Pinterest and blogs and magazines can put a lot of pressure on people to make glamorous amazing spaces, but as the Nester says in her book: “Perfection is overrated”. Acknowledge your hard work and celebrate your space. You did it. 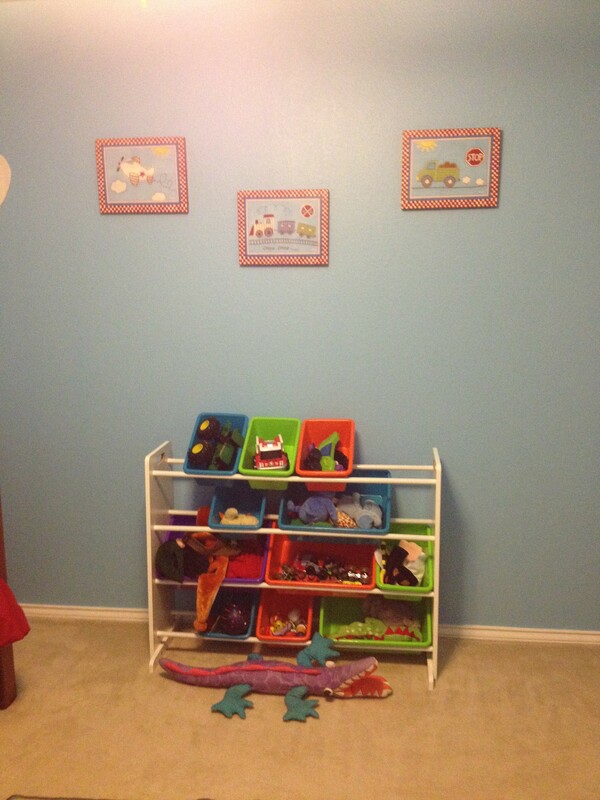 You took the time to pick paint colors and find the perfect pieces to make it work. That is worth celebrating. Thanks for stopping by! Next stop: My little girls room!